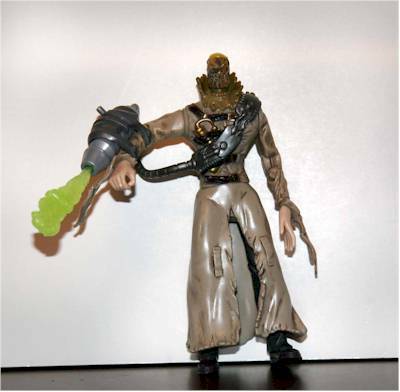 Matt's back with a new Batman Begins review - it's the Scarecrow in his second version from Mattel. What's the 411, Matt? Batman Begins was an awesome movie. I had thought it was going to be a big letdown. I thought the origin story wouldn’t be done justice. I was dead wrong. The movie was, in fact, the first Batman movie all about Batman. Scarecrow has always been one of my favorite Batman villains and from the pictures and articles I had been thinking he wouldn’t be done well at all in Batman Begins. I was wrong again. Scarecrow was a secondary character in the movie but he was cool while he was in it. Then there’s Mattel. This company has made some very strange choices as of late. 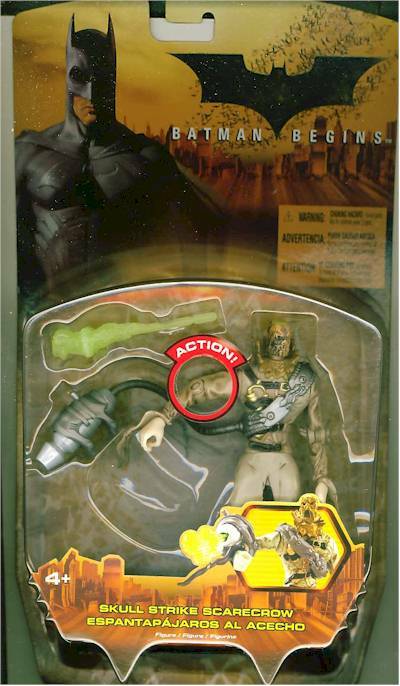 They ditched their comic line with a simply awesome Scarecrow and Bane in the last wave, they released the Bat Begins line the same day as the ROTS line and they made no Scarecrow in his business suit from the movie. 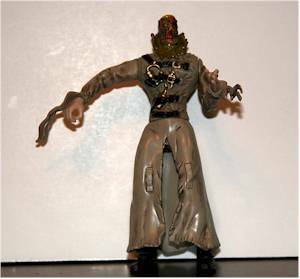 The Scarecrow (Jonathan Crane) figures from Batman Begins are a strange story as well. The first figure we saw images of in initial promo photos was the second one released. I don’t know why the one reviewed today was pushed back but had it come first it would have made the awful first version look even worse. 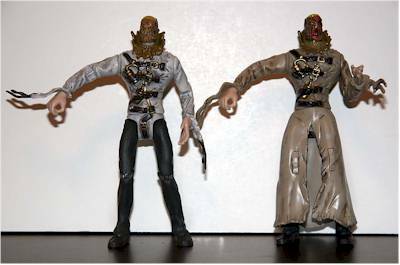 They in fact are very similar sharing an almost identical sculpt not counting the lower portion of the jacket. The paint however, is entirely different. 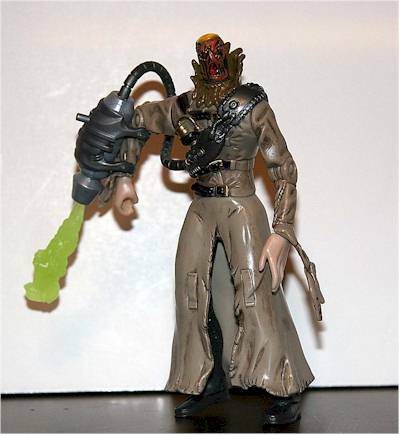 The figure in this review is the second version-Skull Strike Scarecrow. It’s pretty boring to me. It’s a standard multilingual card. The bubble is slightly Batman shaped. This package reminds me a lot of the Spiderman 2 boxes. On the back is a shot of some other figures. 4 of them have *’s next to their number with a note made that they’re coming this summer. On the whole the box does its job and not much else. This is so close to being **. I really couldn’t decide with this one. He is a whole lot better looking than the first version with the inclusion of the bottom of the straight jacket. It’s well sculpted and rubbery still allowing for leg movement. It’s not spot-on but it looks near what he looked like riding the horse. The only problem besides the ones from the first version (the hands, slightly small head) is the silly locks on the jacket. In the movie the jacket hung open revealing a suit. The only tweaking other than the jacket is the hands which have been moved slightly and the hanging straps near the hands which have also been repositioned. I think they should have stuck with the white. In the movie his jacket was clearly white. The brown looks sort of drab. The locks have a bit of slop around them but at least there aren’t weird golden straps. The major plus is the little lines of detail have been filled in with shading showing new areas of stitching and wrinkles I never noticed before. The head looks better in particular. The paintjob is not good or not that awful it’s ok.
It’s the same articulation. 10 POA. The legs are more hindered but still move. At least we don’t have to look at his disproportionate legs this time. No wrist joints still. The reason this is getting *** is because I really can’t think of what Scarecrow could have. It’s a gimmicky metal harness with a rubber cord that shoots a missile. Thank goodness it’s not permanently attached. The part that connects to his arm is removable so you just have a hose thing. The fear gas missile is the best part. 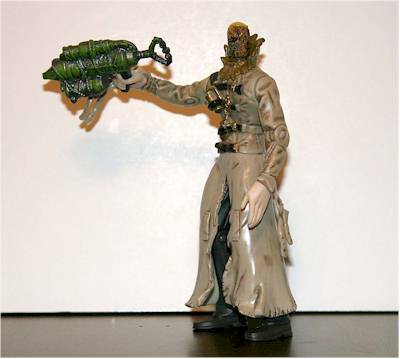 It’s probably the most appropriate accessory other than the skull bomb on the comic version a Scarecrow’s ever gotten. That’s Scarecrow’s main attack—fear gas. The gas missile is green and smoky with a skull on the end personifying someone’s fear. The whole thing might be fun for kids. The lower jacket is not removable. I liked it the first time and I like it now. The arm movement restriction is sort of unfortunate. The difference in the head spin this time is that it clicks into place. He’s not as fun as any Batman figure but better than the first one with the lame water squirt. Kids will probably prefer the comic version or Ras a Ghul. I got him for $4.88 at walmart. That’s a just right value. It might be a temporary thing though. Get them now. I can see other people giving him a slightly lower score than this. Not perfect for sure but at least he is worthy of standing next to an animated figure. I’d love a version in a suit. This one is a start. It’s a solid figure and if you want to know which Bat Begins version to get this is a no-brainer. As I said, he’s almost the same as the first version so pick the one that has the long jacket and cord thing. Many stores may have these but I got him at walmart. Choose a good one as some of Scarecrow’s head features have been abused and don’t turn. Figure from the collection of Matt.